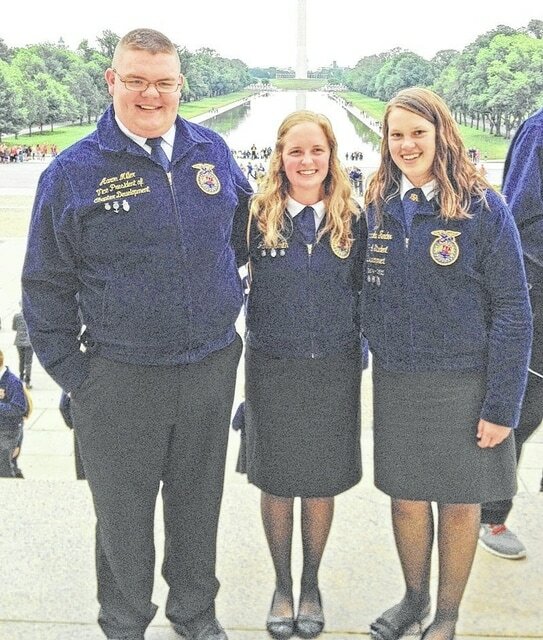 From left to right, Hillsboro FFA members, Aaron Miller, Janice Smith, and Samantha Fender are pictured by the reflecting pool with Washington Monument in the background during their trip to Washington Leadership Conference. More than 2,300 students and 250 teachers are expected to attend the National FFA Organization’s 2015 Washington Leadership Conference. The annual conference, which dates back to 1969, includes seven, one-week sessions in Washington, D.C., from June through July. Three members from the Hillsboro FFA Chapter just returned from attending week one of the conference from June 2-7. Janice Smith, Aaron Miller, and Samantha Fender participated in the week-long conference at the Nation’s Capital with about 350 other students from across the United States. Based at the Omni Shoreham Hotel, FFA members receive instruction and training led by education professionals, counselors and FFA staff. Through workshops, seminars and small groups, students study best practices to advocate for agriculture and agricultural education and learn about the importance of valuing people, taking action and serving others. New this year were opportunities for students to engage representatives from sponsor companies CSX, Monsanto, TransCanada, Farm Credit, BNSF, and Crop Production Services to learn about their operations and discuss future career opportunities. While in the nation’s capital, students toured Arlington National Cemetery and the U.S. Capitol, Newseum, took a night tour of national monuments and visited the Smithsonian. Students also shared needs of their respective communities and worked together to create a community-service project that their FFA chapter can implement in their home towns. The conclusion of each weekly session of the Washington Leadership Conference is a day of community service. Throughout the seven sessions during the 2014 summer conference, 5,168 hours of service were completed during the seven meal packing events and 350,000 meals were packed partnering with Meals of Hope. All meals were a highly palatable Macaroni and cheese mix. All food was delivered to the Capital Area Food Bank and delivered directly to the food insecure of Washington, DC. Last week, students volunteered to pack over 60,000 meals for the DC area. The next six sessions of the Washington Leadership Conference will continue from June 9 through July 26. Submitted by Libby McNeal, Hillsboro FFA adviser.